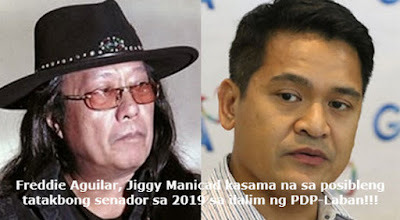 Pinoy music icon Ka Freddie Aguilar and GMA News reporter Jiggy Manicad have joined the list of 20 potential senatorial candidates of PDP-Laban in the coming 2013 midterm elections. This is according to PDP-Laban President, Senate President Aquilino "Koko" Pimentel III on Thursday, April 19, telling Senate reporters via text message. Pimentel, who is also among the possible PDP-Laban senatorial bets in 2019, included the names of five senators who are seeking re-election in their list. They are Senators Grace Poe, Cynthia Villar, Nancy Binay, JV Ejercito, and Sonny Angara. As we all know, all of them belong to the majority bloc. Below is the unofficial list so far. Aguilar, 65, first became famous with his song “Anak,” which has been translated to several languages around the world. He is a staunch supporter of President Rodrigo Duterte, and even composed the President's campaign theme song Para sa Tunay na Pagbabago. Pimentel said that Aguilar and Manigad are already members of PDP-Laban. As the 1987 Constitution clearly states, the required qualifications to run for senator, include being a natural-born Filipino citizen, at least 35 years old, a resident of the country for not less than two (2) years from the day of the election, and being able to read and write. Based on Comelec rules, a Philippine senator shall serve 6 years per term, and can run for re-election. The 2019 midterm elections shall seek 12 new senators to fill in those elected in 2013, and will serve up to June 30, 2025. Meanwhile, Sen. Pimentel said PDP-Laban’s official list of senatorial bets is most likely to be released in in August or September.